Alex Villanueva. Photo courtesy of Alex Villanueva for LA County Sheriff campaign. In 2018, retired sheriff's lieutenant Alex Villanueva defeated the incumbent sheriff, Jim McDonnell, with 53 percent of the vote to become Sheriff of Los Angeles County. Alex Villanueva was born in 1963 in Chicago to a Polish mother and Puerto Rican father. When growing up, he also lived in New York City and Puerto Rico. He enlisted in the U.S. Air Force in 1983, during which period he arrived in Southern California when stationed at Norton Air Force Base in San Bernardino. After completing his Air Force enlistment, Villanueva was commissioned as an officer in the California Army National Guard. In 1986, he was sworn in as a Los Angeles County Deputy Sheriff, launching a career that took him through into patrol at East Los Angeles Station, drill instructing at the Sheriff's Academy, supervising at the women's jail in Lynwood, and serving as a watch commander at Pico Rivera Station. It was at East Los Angeles Station where he met his wife, Vivian, who also went on to serve as a deputy sheriff. Villanueva retired from the department in 2018 at the rank of lieutenant. A young Alex Villanueva commissioned in the California National Guard. Photo courtesy of Alex Villanueva for LA County Sheriff campaign. Villanueva earned a Bachelor of Science in Liberal Studies from Regents College of the University of the State of New York, a Master of Public Administration from California State University, Northridge, and a Doctor of Public Administration from the University of La Verne. Villanueva recounts that speaking out against wrong-doing within the department under Sheriff Lee Baca and Undersheriff Paul Tanaka (both later convicted of conspiracy, obstruction of justice and making false statements) resulted in career retaliation against himself and his wife. He claimed to have been denied opportunities to advance beyond the rank of lieutenant. As for Villanueva’s government/political experience outside the military and Sheriff’s Department, he was appointed in 2015 to the city planning commission for La Habra Heights and, in the same year, ran unsuccessfully for a seat on the La Habra Heights City Council. 1) He is the first Spanish-speaking sheriff in Los Angeles County since 1890 when Martin G. Aguirre served a single two-year term as sheriff from 1889 through 1890. Martin G. Aguirre, Sheriff, 1889-1890. Photo (1898) from The Capital, Volume VII. No. 9, Los Angeles, Cal., Feb. 26, 1898. 2) He was the first sheriff candidate in Los Angeles County to defeat an incumbent sheriff since 1914 when John C. Cline defeated incumbent Sheriff William A. Hammel. Incumbent sheriffs in Los Angeles County haven’t been defeated in an election until now. 3) He is the first Sheriff of Los Angeles County with no previous senior law enforcement command experience since 1921 when William I. Traeger became sheriff. When Traeger was appointed sheriff that year by the Board of Supervisors (replacing, incidentally, John C. Cline), he had served as an Army officer, college football coach, deputy sheriff, Deputy U.S. Marshal and Deputy Clerk of the California Supreme Court, but never in any senior law enforcement role. 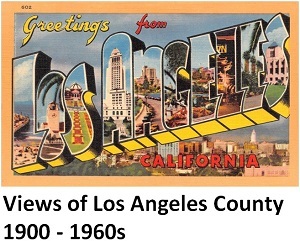 Since Traeger, new sheriffs in Los Angeles County had previously been either an undersheriff (Eugene Biscailuz, Peter Pitchess, Sherman Block), a chief deputy (Lee Baca) or a large-city police chief (Jim McDonnell). For his part, Villanueva retired from the Los Angeles County Sheriff’s Department at the rank of lieutenant, commanding no more than, perhaps, 40 deputies. Villanueva’s historic victory will likely be analyzed for years to come and some say that it reflected how voters felt about McDonnell’s efforts to clean up the scandal-plagued Sheriff’s Department. That may have been a factor, but Villanueva's strong grassroots campaign (particularly in Latino communities) also resulted in a large number of supportive last-minute voters. McDonnell raised eight times more campaign money than did Villanueva and a who’s who list of endorsements from the political and media establishment in Los Angeles County. Villanueva, on the other hand, drew from California blowback against Republicans and shifting views of what is effective "law and order." He made the effort to reach out and connect with Los Angeles County’s enormous but often overlooked Latino community. He received strong support from the powerful Association of Los Angeles Deputy Sheriffs (ALADS), the union representing rank-and-file deputies, which independently spent $1.3 million dollars for mailers in support of Villanueva. Unfortunately, Villanueva’s success is almost immediately colored by an allegation of “straw donor” campaign contributions (an illegal effort to circumvent limits on personal political contributions) orchestrated by a Villanueva business supporter (the Los Angeles County District Attorney’s Office is looking into the allegation). To be fair, the allegation is against a supporter, not the Villanueva campaign itself. However, Villanueva declined to return the questionable donations, casting a troubling shadow on his political intuition even before assuming office. Villanueva assumed the job with no senior command experience of his own, as did his long-ago predecessor, Sheriff Traeger. Unlike Traeger, however, who initially oversaw perhaps 100 employees when becoming sheriff, Villanueva faces a steep learning curve to effectively command the 20,000 employees of the largest and most challenging sheriff's department and jail system in the United States. Immediately upon becoming sheriff, Villanueva relieved and replaced most of the Sheriff's Department senior commanders. As dramatic a transition as that was, what is most concerning is his stated intention to dismiss the department's two constitutional policing advisors. Their purpose is to serve as non-law enforcement advisors to the sheriff on dealing ethically and legally with deputies who misbehave. The deputies's union, which threw their weight behind Vilanueva's campaign, wants these advisors gone. Such a move, however, is setting off alarm bells among those fighting abuse and lack of accountability in the Los Angeles County Sheriff's Department.